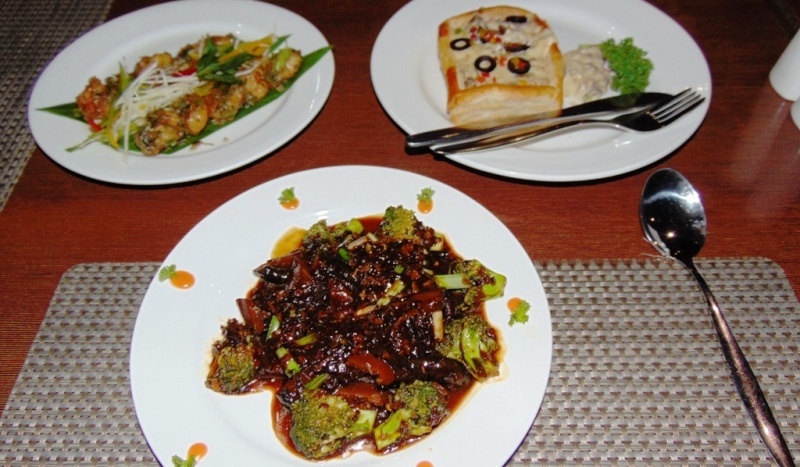 Trivandrum: Uday Suites, the Airport Hotel at Shankumugham and part of the Uday Samudra group, has relaunched the a la carte menu of their Southern Express multi-cuisine restaurant after three years. The inaugural day tasting session started with the Italian Broccoli Almond Cappuccino (florets of broccoli cooked in cream and almonds) with a slice of toasted bread for soup. For starters, it was Travancore spicy Chicken satay which was spicy chicken breast squared and grilled with Chef’s special masala. Wild Mushroom Fricassee from the Western Food section, squire puff pastry filled with wild mushroom, bell pepper and olive with rich creamy gravy was next. From the Pan Asian Pot, it was Prawns in Chilly Coriander. These were medium prawns mildly cooked with garlic and chilly, flavoured with coriander leaves. Then came Broccoli & Shitake Mushroom in Honey Ginger sauce, a Thai vegetarian delicacy with broccoli florets and dried shitake mushrooms. The highlight of the main course was the Fish Tikka Pahadiwali, an innovative dish of Tandoori Fish Tikka cooked with creamy spinach gravy and a melange of coloured bell pepper. The Kashmiri style chicken delicacy rich with saffron petal and cream – Kashmiri Murg Kesar Korma; Meen Ghee Roast, king fish chunks deep fried, tossed in Chef’s special masala and seasoned with ghee; and Rogan Josh with appams and Kashmiri Pulav completed it. English Apple Pie, Blueberry Cheese Cake, Walnut Cowboy Brownie and Orange flavoured Carmel Custard made up the desserts.